Ex-Trust bank owner Fetisov declared bankrupt | Russian Legal Information Agency (RAPSI). MOSCOW, May 7 (RAPSI) – The Commercial Court of Moscow Region has declared one of the former Trust Bank owners Nikolay Fetisov bankrupt, RAPSI learnt in the court. 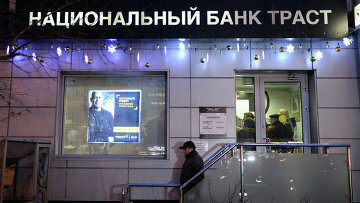 In November, the court initiated the procedure of debt restructuring on the request of Trust Bank against Fetisov. The bank’s demands seeking 3.59 million euros and about 101 million rubles (about $1.7 million) were included in the creditor’s demands list. In April 2017, the Ninth Commercial Court of Appeals dismissed Fetisov’s appeal over transfer of the bankruptcy case to the Moscow Regional Court. On January 10, the court of appeals found Trust bank’s lawsuit legal. In late December 2014, the Central Bank of Russia said it would provide Trust Bank with up to 30 billion rubles ($530 million) to stop it going bankrupt. At the time the bank was placed under temporary supervision of the Deposit Insurance Agency it was on the list of top 30 Russian banks. The financial rehabilitation of Trust Bank was led by FC Otkritie Bank, part of Otkritie Holding JSC. On December 17, 2015, Moscow's Tverskoy District Court issued an arrest warrant in absentia for three former owners of the bank implicated in a large-scale embezzlement case. As reported earlier, they allegedly concluded sham credit contracts with companies registered in Cyprus and then transferred funds to accounts controlled by Trust Bank ex-owners. 11:32 07/05/2018 The Commercial Court of Moscow Region has declared one of the former Trust Bank owners Nikolay Fetisov bankrupt.